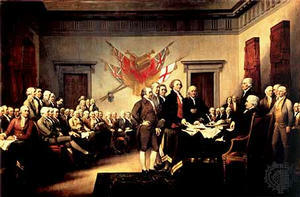 Hassan Shibly: Official Blog: What Would America's Founding Fathers Say About Islam? What Would America's Founding Fathers Say About Islam? In recent weeks, people the world over have heard a great deal about divisions and conflict between Muslim communities and America. Yet, looking more deeply at American history shows how much American tradition actually runs in the opposite direction. In today's seemingly divisive world, I cannot help but think of the values of America's Founding Fathers and their faith that America would always be a place that is open to people from all religious backgrounds. d absolute acceptance of Islam and, indeed, all religions. "The bosom of America," wrote George Washington in 1783, is "open to receive ... the oppressed and persecuted of all nations and religions, whom we shall welcome to a participation of all our rights and privileges ... They may be Mahometans [Muslims], Jews, or Christians of any sect, or they may be atheists." John Adams, who served as vice president under George Washington, called the Prophet Muhammad one of the world's "sober inquirers of truth." Echoing Washington, he stated in 1797 that the U.S. government "has in itself no character or enmity against the laws, religion, or tranquillity of [Muslims]." Benjamin Franklin helped fund the construction of a religious temple in Philadelphia that would be open to all faiths, "so that even if the Mufti of Constantinople were to send a missionary to preach [Islam] to us, he would find a pulpit at his service."